These are HD wallpapers of The Fast and Furious 3: Tokyo Drift. Various sports car are featured here. If you would like to see The Fast and Furious 3: Tokyo Drift HD Wallpapers with show girls, please visit Show Girls Wallpapers. 2006 Nissan 350Z with Top Secret body kit driven by Morimoto. In the movie, Morimoto Collides head on with a green Toyota Aristo causing a massive pile up that presumably kills him. 2006 Mazda RX-8 with VeilSide body kit, driven by Neela. This right-hand-drive RX-8 is lowered using Tein springs and sits on Volk Racing GT-AV wheels wrapped in Toyo Proxes tires. Under the hood a GReddy single turbo system and a Tanabe cat-back exhaust system boost power. 2003 Mitsubishi Lancer Evolution IX GSR featuring APR graphics and body kit. 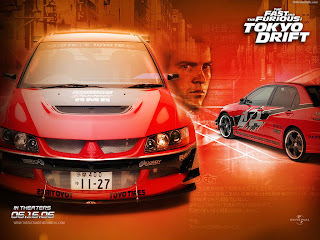 Mitsubishi donated 10 new JDM EVOs to the film and eight were specially modified to rear wheel drive only using a kit developed by Rhys Millen Racing (RMR). The kit replaces the differential output assembly with one that leaves out the splines to drive the front wheels and the output holes in the transfer case are capped. The factory transverse mounted six-speed transmission and remaining drivetrain is left stock. Lancers come from the factory with an AWD transmission and rear wheel drive swaps are performed to improve drifting performance. Driven by Sean when he is learning how to drift. 2006 Nissan 350Z featuring VeilSide wide body kit. 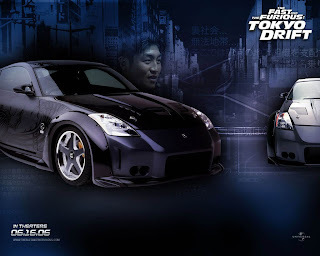 Villain DK drives the 350Z in the parking garage scene and later plunges off the mountain while touge racing against the Ford Mustang. 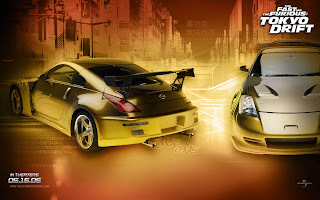 Eleven 350Zs were built for the film and two cars were equipped with an APS twin turbo system, APS turbo-back exhaust, and Magnaflow mufflers that raised horsepower to approximately 450. The suspension features RSR lowering springs, 19-inch Veilside rims, and Toyo Proxes tires. The movie is great. Thanks for this wallpapers. Seeing these are really motivating and inspiring towards my car.